Here is a new baby blanket for my little big champ. He actually helped me crochet by sitting beside me and played with the yarn, and the growing blankie, as I worked. 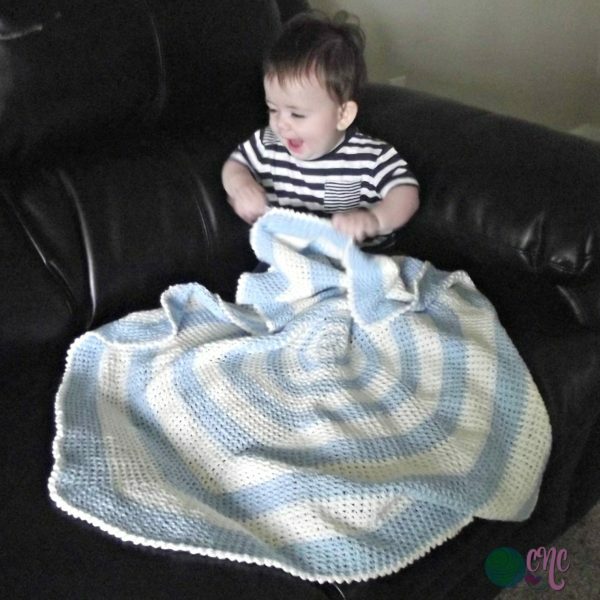 As it got bigger we played peek-a-boo with it… We both had so much fun, it was almost sad when we finished… I’m sure you know the feeling if you enjoy mindless crochet patterns. It’s shown here in a baby size, but you can actually continue to increase this to any size you want. And that also means you can use any yarn and hook you like. I used a soft cotton, which makes it comfy and cool for the summer months… or any season! You will definitely want to block this as it ruffles, and the blocking also brings out the pretty spiral along the increases. 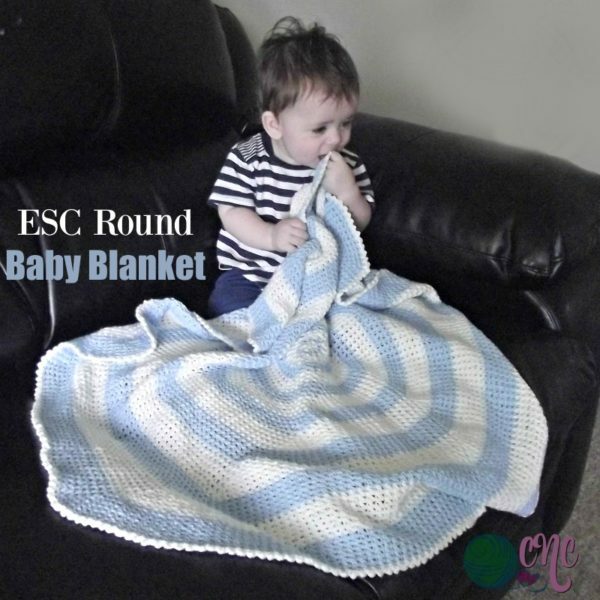 The yarn used, is a beautiful and soft yarn called Nurture by Euro Baby. It’s available through the Yarn Candy Bargains Facebook Group, and you can check out this post on pricing info and available colors. It’s a DK weight cotton yarn; it’s soft and ideal for anything baby, clothing or for anything where softness and a beautiful drape is desired. And according to the label, it’s also machine washable on a very gentle cycle, and you can tumble dry as well. Gauge: 3″ across diameter of first 4 Rnds. Finished Size: Blocks to approximately 40″ across the diameter. Picot: Ch 2, sl st in 2nd ch from hook. Aside from working into the 2nd ch from hook in Rnd 1, all chs are skipped in this pattern. Beginning in Rnd 2, you will only work into the esc. Mark first esc to help you see better in regard to joining and working your next row of stitches. This pattern is written out long; however, you don’t need to have the pattern in front of you past the first few Rnds. Simply remember to work an increase into first stitch of previous increase. Then change your colors up as follows: Work 1 round with CA and 1 round with CB, then 2 rounds with CA and 2 rounds with CB, 3 rounds with CA and 3 rounds with CB etc, etc until you reach a desired size. Change to new color in joining slip stitch of the round. Rnd 57: With CA, Ch 1, (sc, picot) in same st as join and into each st around; join with sl st in first sc. [336 sc and 336 picots] Fasten Off. 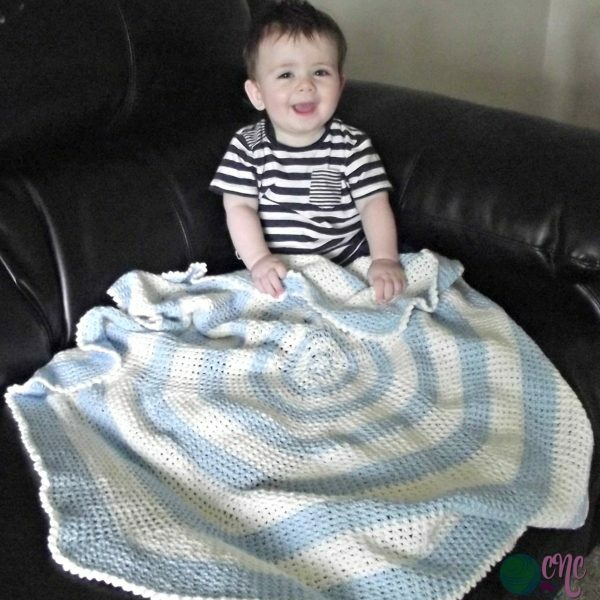 More Free Baby Blanket Patterns are available at CPB. And another cutie for those who scrolled down this far. :) He just woke up, so his eyes are a wee bit sleepy still. But you gotta love that smile and funky hair-do!